In keeping with the developing “Pietenpol Week” theme, today Vern and I drove about 2 hours to the northern edge of Florida to make a house call on a Corvair powered Pietenpol that has been flying since 1977. The plane is the handiwork and pride of a builder named Pat Green. Even though I have known him for 15 years and we live in the same state, Pat and I don’t often have a chance to get together. Above, Pat’s Pietenpol. It has more than 1,000 hours on Corvair power. The installation has always been very close to BHP’s plans externally, but internally Pat went to forged pistons and an OT-10 cam more than 10 years ago. He was flying long before I started working with Corvairs, but he was never reluctant to adopt any improvement that my testing revealed. His original conversion manual from us was one of the first 50 I had printed, I have known him that long. Many years ago he flew the plane to Corvair College #9, where he was much appreciated by Piet builders in attendance. In the years since, we have been very busy and Pat was deeply involved in the hour by hour care of his late wife. After beating a few health issues of his own, Pat paid a visit to our hangar where he explained that his personal plan was to get back into flying full-time and really enjoy all the elements of it that he used to before greater responsiblity took priority. A key element of this was switching from a traditional Bernard Pietenpol hand prop/blower fan engine to one of our electric start systems. He had been hand starting the plane for 35 years, but being 77 and having had back problems, he thought going with key starting was a safety issue, and made the prospect of operating the plane solo a lot more appealing. From that point we made a plan for a house call and to get him a running start on a conversion to electronics doing the starting. 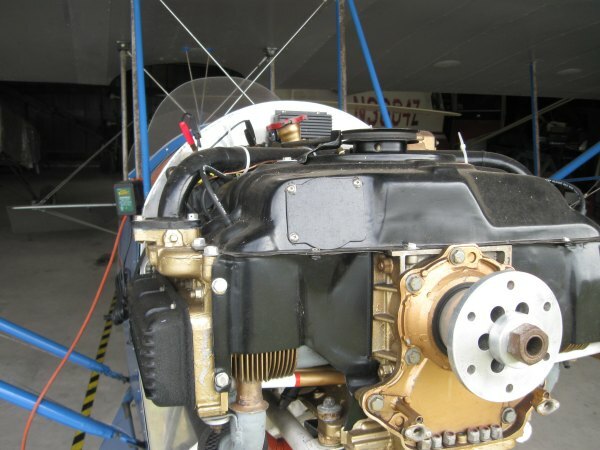 Above, a shot of the original BHP/blower fan conversion from an angle that illustrates why an engine set up this way doesn’t fit well with a high thrust line engine mount. engines with starters and J-3 eyebrow scoops can utilize a higher thrust line and still fit inside the shape of the fire wall. The Prop hub is an original BHP model. It is mounted by the original short flywheel bolt in very deep wells. I developed Hybrid studs 15 years ago to improve the mounting of the prop hub for engine with more output than traditional BHP conversions. A BHP hub can not be used with any of our starter set ups. Pat actually traveled to Cherry Grove and spent time with the man himself. Pat stuck with the project and finished it after 10 years of on and off building. The plane was not the only aircraft in his life, there were many. But as he gets to the other end of his flying years, he is very clear that his Pietenpol is the centerpiece of his aviation life, and without question the best thing he ever did in planes. The Sport Pilot rule will allow Pat to fly the plane for many years to come, so it is inevitable that it will be the last plane in the stable of planes he has kept, but he says that all medical factors aside, if he were to have had only one plane, the Pietenpol would have made him the most happy. He will be very glad to finish out his flying hours in the plane, and he will log a lot more of them with a starter. 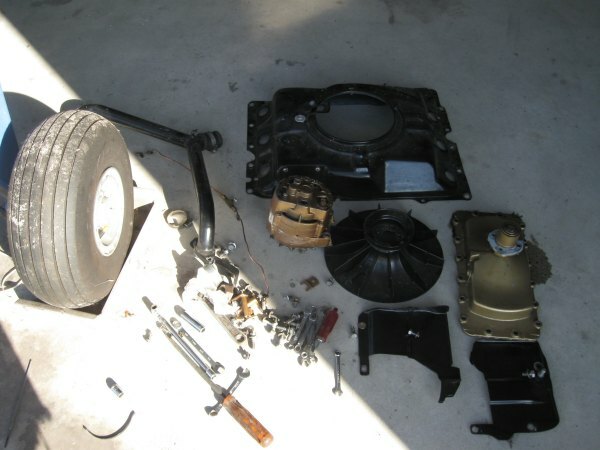 Above are the blower fan parts that came off the engine when putting the Front starter on. There are people who have suggested that this stuff weighs a ton, but it doesn’t the fan is magnesium ( we put a story up last year about burning them in a bonfire at one of our airport parties) and weighs less than a pound. All in all, an electric start system is going to add about 20 pounds to the airplane after you take into account things like the larger battery. It isn’t shown in the photos, but Pat is going with a John Deer style front alternator driven off the Gold hub. 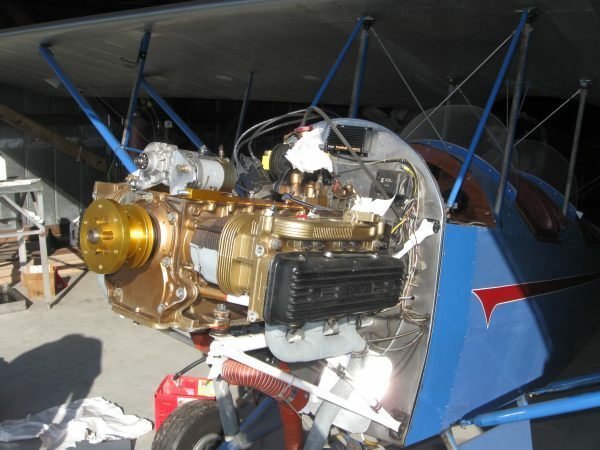 Above is a look at the engine being test fitted with the starter and the gold hub. The parts, including the starter kit, a new hub, hybrid studs, the alternator , brackets, regulator and a belt cost Pat about $1,400. 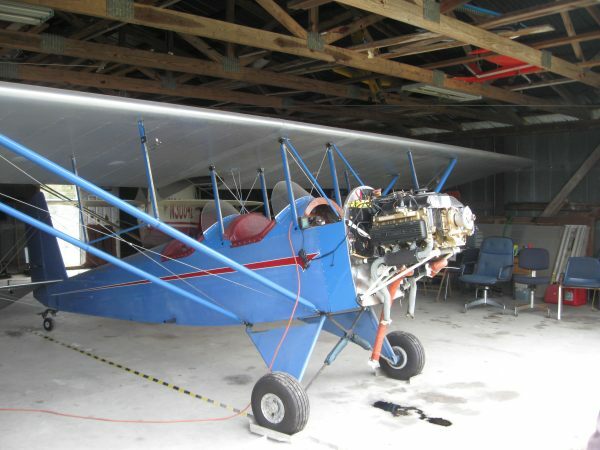 It is going to take a bit of time to re-configure the cowl and wire the electrical stuff, but overall, it isn’t a lot of money or time to get the plane set up to layout that is a much better match for Pat’s next few years of flying. Below: Blast from the past, Pat and I stand with his Pietenpol at Corvair College #9, seven years ago. The caption in blue italics below is the original words from the 2006 College. note to fashion critics: I haven’t always had long gray hair, but I have always dressed like a refugee, even long before it was stylish. A few words about house calls and service to builders: The trip up to Hillard, a few hours of work and back took seven hours today. I charged Pat my standard rate for a house call: Zero dollars. If you get a look at the years of such house calls documented on our websites, keep in mind that I have never charged any builder, wether we were old friends or not, for a house call. Some have been fairly close like todays, many have been on the way to or from airshows, but there have been others that involved getting on an airliner to go help a builder solve an issue. All of this was done at no cost. Our business makes fair profit on the items we provide, but I don’t view every interaction with builders as a opertunity to generate revenue. That is how a corporation or a LLC might think, but not me. I remember talking to Pat years ago about the extended vertical fin on his Piet (you can see it in the first photo). Seems he was having some occasional directional control issues on landing (sudden, uncontrollable attempts at runway excursions if I remember correctly) that were traced to the tail getting blanked by a tall pilot, that were cured by extending the tail a bit. I don’t know that this is a common problem, there aren’t many Piets with tall tails, but it seemed like a common-sense, low-risk approach to solving a problem, much like upgrading to the electric starter. Sad that some folks out there would have just sold their plane, or lived with the shortcomings when the solution teally was not a huge deal to implement. Pat’s plane has literally been improved from nose to tail! him. Not only aeroplanes but about life. We flew together in our aeroplanes many times. We went to the Thomasville Ga Fly-in together but I had to stop for fuel due to my very limited range. I think that was the best times in my flying life flying with Pat side by side in our aeroplanes that we built ourselves. So many great memories that only a few know or even dream of. William I think it is time to visit Pat again.